The bodysnatchers Burke and Hare attained legendary status, to this this, for their dark deeds in Edinburgh's backstreets. Burke's eventual capture, execution and dissection at the same Surgeons' Hall which he'd supplied bodies too was a perfect allegory for the ends of justice in the eighteenth and nineteenth century. 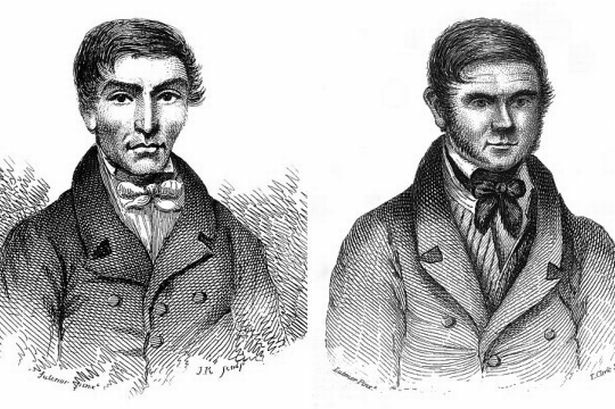 William Burke and William Hare were arguably the most infamous and vilified criminals of the early nineteenth century. Both Irish Labourers, they had come to Scotland to work as navvies on the building of the Grand Union Canal. However, they soon found a far more lucrative trade, supplying the bodies of the recently dead to the eminent Edinburgh surgeon Dr Knox. Knox was renowned for his anatomical lectures and the pair were paid handsomely for providing him with a steady stream of cadavers, around £7 a body. However, they soon decided that nature wasn't taking its course quick enough on Edinburgh's residents, so they started to speed up the process. Burke and Hare began to smother people, a practice that became known as burking. Their case was to have a lasting affect on both criminal legislation in the nineteenth century and was a key factor in the introduction of the 1832 Anatomy Act. Despite the provisions of the 1752 Murder Act, there was still a profound shortage of bodies for anatomical instruction for surgeons up and down the country. This was particularly true in Scotland, where execution rates were comparatively far lower than in London. Across England, Wales and Scotland an illicit trade grew in which bodies were procured from graveyards by ‘resurrectionists’ or ‘body snatchers’ often in the employ of leading surgeons. So feared was this trade that many coffins were reinforced and graveyards given stronger protection, a lasting legacy that can still be seen in many graveyards. Such was the fear of the surgeons and resurrections that fights would often break out at the foot of the gallows, in an attempt to rescue the recently hanged criminal's body from the anatomists’ slab. Burke and Hare were two such opportunists, who began to make money by supplying bodies of the recently deceased to eminent, Edinburgh Anatomical Lecturer, Dr Knox. However, they soon decided that they needn't wait for people to die of natural causes, when they could smother or 'burke' them themselves. The pair were caught, but Hare turned King's Evidence (testified against Burke) and as a result, only William Burke was sentenced to execution. Burke was sentenced to be hung on January 28th, 1829 in Edinburgh's Lawnmarket. A huge crowd turned out to watch the spectacle and many reports detail an angry crowd trying to get at his corpse to do damage to it. The site of Burke's and other public executions in Edinburgh are still marked to this day, by a plaque and three brass plates in the pavement, indicating the position of the gallows. In a cruel irony, Burke was given the additional post-mortem punishment of dissection and his body, after execution, was taken to the Edinburgh Surgeons' Hall - the very establishment where he had made so lucrative a trade in supplying bodies for instruction. The Judge at his sentencing had argued that gibbeting the body of Burke would have offended the senses of the public, although various newspaper reports mention crowds expectantly waiting for a gibbet to be erected. The officiating surgeon at Burke's dissection was one Dr Monro. Burke's body was put on display at the Edinburgh Surgeon’s Hall and was reportedly viewed by over 30,000 members of the public. His skeleton was on display at the Edinburgh Anatomical Museum for many years and is still viewable, to this very day, on an interactive app. But what of Burke's ertswhile partner in crime and indeed his employer, the venerable Dr Knox. Dr Knox sits along other 'notable alumni' of Edinburgh University to this day, albeit indelibly linked to the burking scandal, whilst Burke suffered the horror of execution, public dissection and his skeleton being a museum exhibit ever since. And what of William Hare, who turned King's Evidence? After all, the practice of smothering the living to provide them for anatomical instruction could just as well have been called 'Hareing.' Although the historical record is not entirely clear, it would appear that Hare was released in February 1829 and seemingly disappeared. The case of the bodysnatchers Burke and Hare was a scandal of national proportions and had lasting ramifications, that reached far outside of Scotland. The popular anger surrounding the case led to renewed moves in parliament to end the grisly, illicit trade of bodysnatching. Chief amongst these was the passing of the Anatomy Act in 1832, a measure that simultaneously ended the post-mortem punishment of dissection for murder and created a new stream of bodies for surgeons, who could now use bodies of the unclaimed workhouse poor. BANNER IMAGE: Execution of the notorious William Burke, the murderer who supplied Dr. Knox with subjects.